The Normal, Ill., plant will close if Mitsubishi doesn't find a buyer. Some Asian automakers tested the waters on U.S. manufacturing through partnerships. These were among the first wave. Diamond-Star Motors Normal, Ill. Mitsubishi-Chrysler 1988 Chrysler pulled out in 1991; Mitsubishi now wants to sell it. NUMMI Fremont, Calif. Toyota-GM 1984 GM pulled out in 2009; Toyota closed the plant in 2010 and sold it to Tesla for $42 million. Mazda Motor Mfg. (USA) Flat Rock, Mich. Ford-Mazda 1987 Opened as a wholly owned Mazda plant, building both Mazda and Ford cars. Ford bought half in 1992, renaming it AutoAlliance International., then took full control in 2012 when Mazda ended production there. Subaru-Isuzu Automotive W. Lafayette, Ind. Subaru-Isuzu 1989 Subaru bought Isuzu's stake for $1 in 2002. As Subaru of Indiana Automotive, it began building Toyotas in 2007, but the plant will revert to Subaru-only output in 2016. CAMI Automotive Ingersoll, Ontario Suzuki-GM 1989 Designed to help GM learn how to build small cars profitably with union labor; Suzuki sold its 50 percent stake to GM in 2009. Bromont Assembly Bromont, Quebec Hyundai-Chrysler 1989 Wholly owned Hyundai plant opened with a commitment from Chrysler to buy a rebadged version of the Sonata, then Chrysler changed its mind. Production ended in 1993. Mitsubishi Motors Corp.'s decision last week to sell its only U.S. assembly plant illustrates an emerging new-world order in car production. Mitsubishi's Normal, Ill., plant was part of a wave of Asian-brand joint-venture auto plants in North America that opened in the 1980s and 1990s to do whatever was necessary to crack the all-important U.S. retail market. 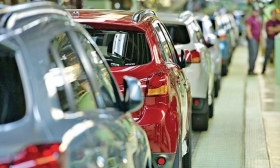 Mazda, Toyota, Subaru, Isuzu, Suzuki and, briefly, South Korea's Hyundai also opened North American joint-venture production lines in that era. All have either closed or morphed into other production arrangements. The new reality: Auto production is increasingly shifting to more cost-efficient global platforms and world supply bases that serve multiple markets. Mitsubishi now finds itself competing not just against "built for U.S. consumption" auto ventures but against new-world strategies such as that of Mazda Motor Corp. Mazda once relied on a joint-venture with Ford Motor Co. in Flat Rock, Mich., to sustain its U.S. sales, but it now has opened a Mexican car and engine complex that will serve as the global export base for all of its Mazda3 and Mazda2 production while also supplying small cars to Toyota. Likewise, Daimler AG and Nissan Motor Co. are constructing a $1.3 billion factory in Mexico that will yield six models of a jointly engineered compact premium platform that will be sold around the world. By comparison, Mitsubishi's Illinois factory, which opened in 1988 as a multimodel 50-50 Chrysler partnership that was capable of producing 240,000 cars a year, has been struggling as a Mitsubishi-only factory, although it built a few Chrysler-badged cars until 2005. Last year, it built just 69,178 vehicles. Conjecture has swirled for two decades that Mitsubishi would walk away from Normal, which today is the only Asian auto operation in the U.S. with a UAW-represented work force. The union local's contract expires in August. In a statement to employees and dealers, Mitsubishi said it planned to close the plant in November 2015 if it can't find a buyer. A source said Mitsubishi has several candidates, including possibly some Detroit automakers, for the low-volume plant. Some analysts questioned the wisdom of ending U.S. output. "Mitsubishi has struggled to grow U.S. sales for several years, and its limited product portfolio means many buyers never seriously consider the brand," said Karl Brauer, a senior analyst at Kelley Blue Book. "It's hard to imagine how moving production out of the U.S. benefits the Japanese automaker from a cost or logistical perspective. Is Mitsubishi looking to grow, or even maintain, its presence in the U.S. car market? Ending production in Illinois doesn't support either goal." Mitsubishi vowed to continue selling vehicles in the U.S. while finding a buyer for the auto plant. "The North American market remains a priority for Mitsubishi Motors," said a statement from the automaker's U.S. subsidiary, Mitsubishi Motors North America Inc. in Cypress, Calif. "We will continue to sell Mitsubishi cars, including current and planned models, at Mitsubishi dealerships across the U.S."
The brand has 373 U.S. dealerships, down from 386 in 2014. For the Normal plant, the competitive landscape has changed -- since 1988, and in the past two years. n A weaker Japanese yen has sparked new interest in Japan as a world export base. This month, Nissan said it will begin building 100,000 Rogue crossovers a year in Japan for the U.S., augmenting Rogue production in Smyrna, Tenn. Nissan moved the Rogue to a U.S. factory in 2013 specifically to free it from what was then an uncompetitive yen. n Liberal foreign-trade agreements have made Mexico attractive as a regional and global production base. Mazda, as well as Honda, Toyota, Kia and Nissan, are planning to produce more export models in new Mexican plants. n A key piece of Mitsubishi's plan for the Normal factory, exporting vehicles to Russia, has crumpled amid a steep Russian recession. Otherwise, things actually have been looking up for Mitsubishi. Its U.S. sales rose 25 percent to 49,544 vehicles in the first half. U.S. sales of the Outlander Sport, built at Normal, are up 17 percent. Mitsubishi and its minority share owner Chrysler opened Normal as Diamond-Star Motors, with a plan to build Mitsubishi, Plymouth and Eagle-brand models. But Chrysler's financial troubles caused it to pull out in 1991. Mitsubishi's sales peaked in 2002 at 345,111. Normal's production peaked two years earlier at 221,975. The plant now employs 918. The company statement said that "our focus right now is to identify a buyer who would continue to operate and maintain employment -- the best potential outcome for our employees and the community."